Mix all the dry ingredients well. Melt the butter and add it in the dry ingredients and mix it well. Add condense milk and stir it continuously with the spoon while pouring to mix the batter equally. Add water and mix it well to the dropping consistency. Grease the baking tray and sprinkle some flour so that the cake does not stick. Pour the batter into the tray. Pre heat oven, bake at 180 degree C for 25-30 minutes, or till it is done. After 25 minutes check it by inserting the knife in it, if it comes out clean then it is ready, if not then bake for 5-7 minutes more. 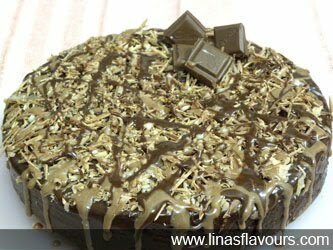 Spread chocolate sauce on the cake. Sprinkle grated chocolate on it.